Sunflower field in North Dakota, the state is among the top producers of sunflowers in the US. Where in the United States is North Dakota? Location map of North Dakota in the US. North Dakota is a landlocked state in the Great Plains of north central US, south of Canada. 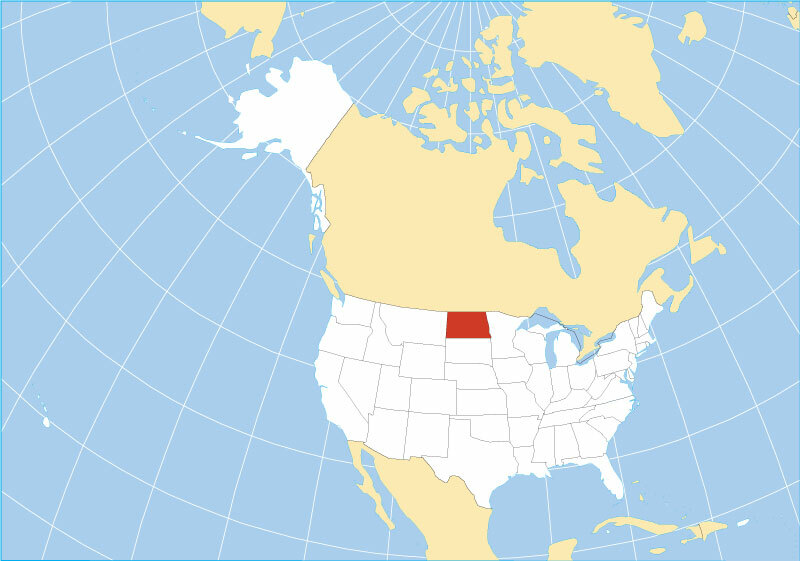 The state borders South Dakota in south, Montana in the west, and the Canadian provinces of Saskatchewan and Manitoba in north. The Red River of the North shapes its border with Minnesota in east. 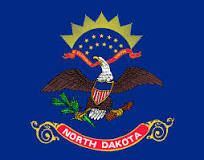 The region of today North Dakota was acquired partly by the Louisiana Purchase in 1803, and partly from Britain by treaty in 1818, it became the 39th US state in 1889. North Dakota occupies a total area of 183,107 km² (70,698 sq mi) , making it slightly smaller than half the size of Germany. Compared with other US states, North Dakota is eight times as big as New Jersey, but it would fit into Texas almost 4 times. The state's landscape can be divided in several regions, there is, along its border with Minnesota, the flat Red River Valley, the lake bed of the ancient Lake Agassiz, a remnant of the last glacial period (ice age). Going further west you will reach the Drift Prairie, an area with gently rolling hills and shallow lakes. The Laurentian Divide cuts diagonal through the state, from north west to south east, the continental divide separates the river systems that flow northwards to the Arctic Ocean and Hudson Bay from those that flow southwards to the Atlantic Ocean. The Missouri Escarpment defines the edge of the Missouri Plateau in the center of the state, the plateau (Coteau du Missouri) is a wast upland expanse of the Great Plains that occupies the south western third of the state. 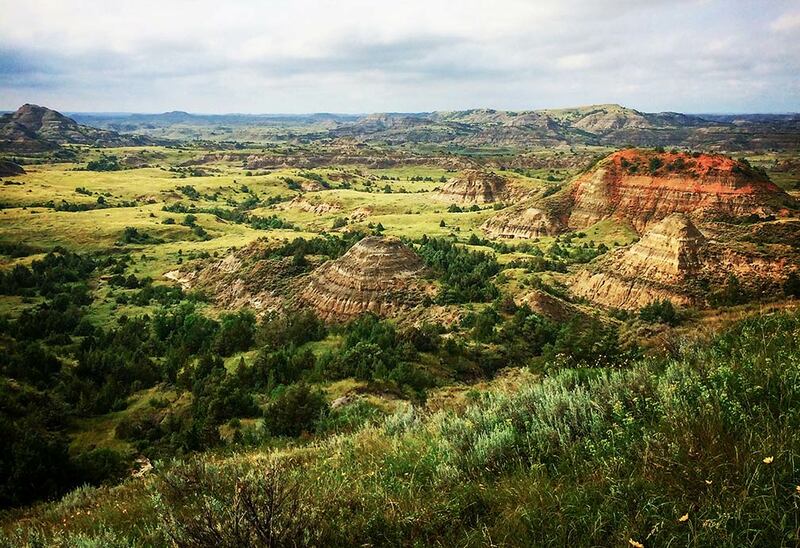 Within the plateau are North Dakota's Badlands, a hilly, treeless landscape along the Little Missouri River offers buttes, pyramids, domes, and cones. Major rivers are the Red River of the North which defines North Dakota's border with Minnesota. The Sheyenne River is one of the major tributaries of the Red River of the North. 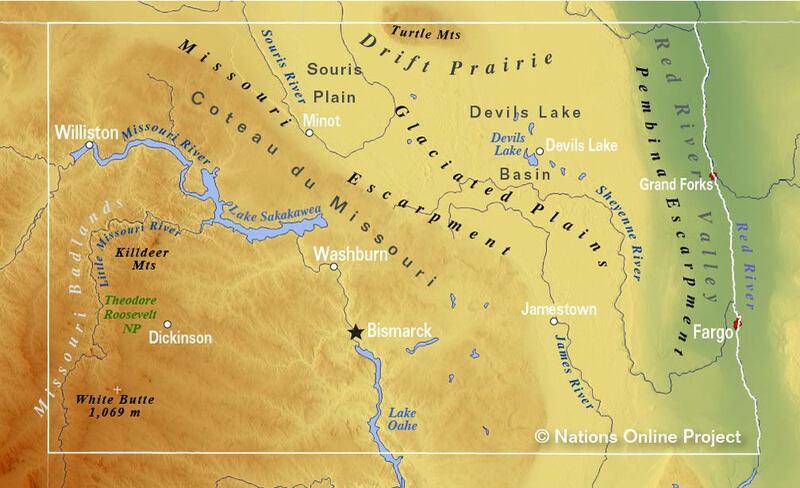 The Missouri, the longest river in North America 3,767 km (2,341 mi) flows east and south through North Dakota. The river was one of the main transportation routes for the westward expansion of the United States during the 19th century. Lake Sakakawea in North Dakota in January. The reservoir is created by an earth-fill embankment dam on the Missouri River, it is the third largest man-made lake in the US. Tributaries of the Missouri in North Dakota are the Yellowstone River, the 1,110 km (690 mi) long stream is the principal tributary of the upper Missouri; the Little Missouri of North Dakota is a 900 km (560 mi) long river in the northern Great Plains, the James River (aka Dakota River) is a 1,140 km (710 mi) long river provides the main drainage of the flat lowland area of the Dakotas between the two plateau regions known as the Coteau du Missouri and the Coteau des Prairies. The Souris River (aka Mouse River in the U.S.) drains a portion of the Drift Prairie known as the Souris Plain. Highest point is White Butte at 1069 m (3,508 ft) located in the Badlands in the south western corner of the state. 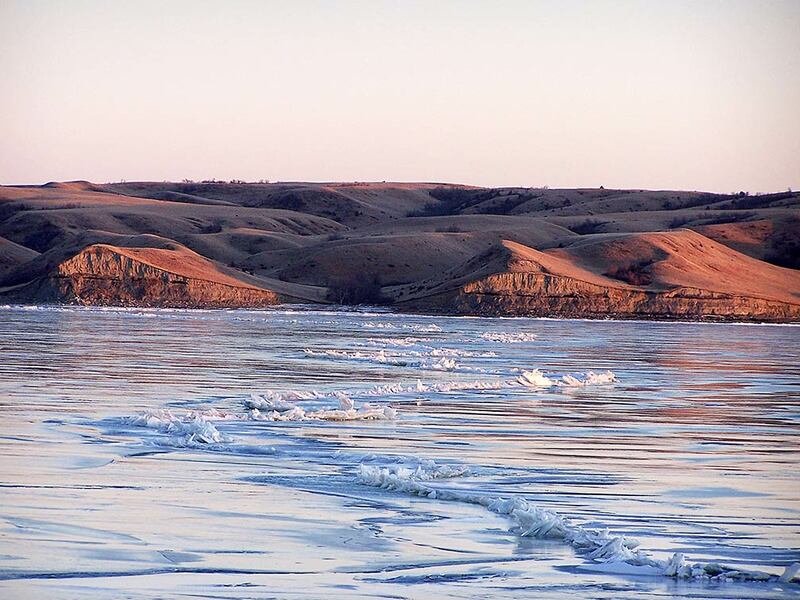 North Dakota's geographical highlights are Lake Sakakawea, a reservoir within the Lake Sakakawea State Park in the Missouri River basin. The Theodore Roosevelt National Park, three geographically separated areas of badlands (https://www.nps.gov/thro/index.htm). 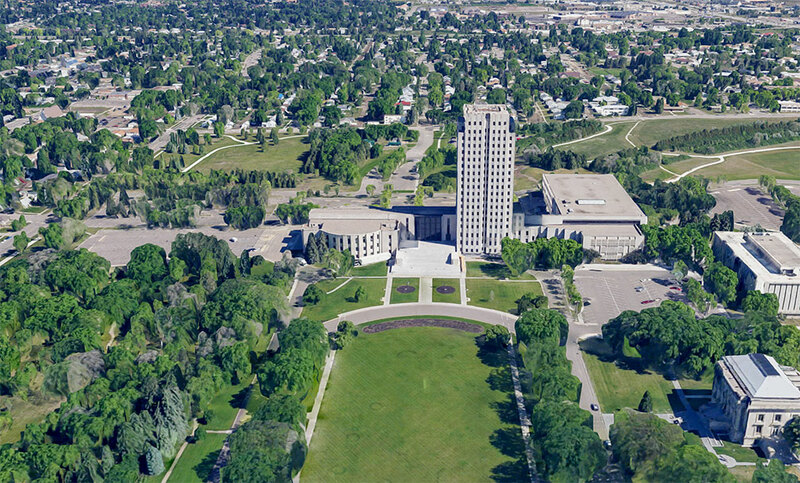 Rendered image of the North Dakota State Capitol in Bismarck, the state's capital. The 21 story tower and the surrounding office buildings house the state's legislative and judicial branches, as well as numerous government agencies. North Dakota has a population of 758,000 people (est. in 2018) , it is among the least densely populated US states (rank 47). State capital is Bismarck, largest city is Fargo, largest metro area	is Fargo metropolitan area (pop. 235,000). Official state language is English. Largest airports in the state are Fargo's Hector International Airport (IATA code: FAR), Bismarck Municipal Airport (IATA code: BIS), and Minot International Airport (IATA code: MOT). 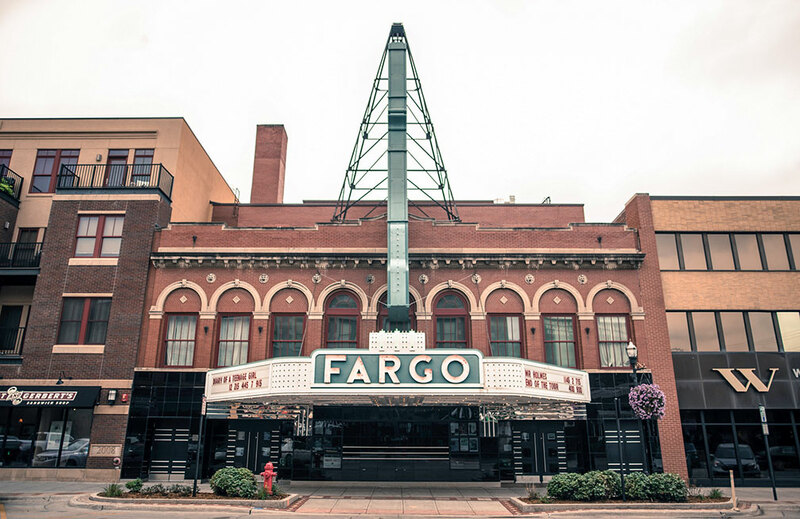 The iconic Fargo Theatre, an art deco movie theater in downtown Fargo, the most populous city in North Dakota. Ashley, Beach, Belfield, Beulah, Bottineau, Bowman, Cando, Carrington, Carson, Cavalier, Cooperstown, Crosby, Devils Lake, Edgeley, Ellendale, Fort Yates, Garrison, Grafton, Harvey, Hettinger, Hillsboro, Jamestown, Kenmare, Lakota, Langdon, Linton, Lisbon, Mandan, McClusky, Mohall, Mott, Napoleon, New Town, Oakes, Pembina, Portal, Rocklake, Rugby, Stanley, Towner, Valley City, Wahpeton, Washburn, and Watford City. 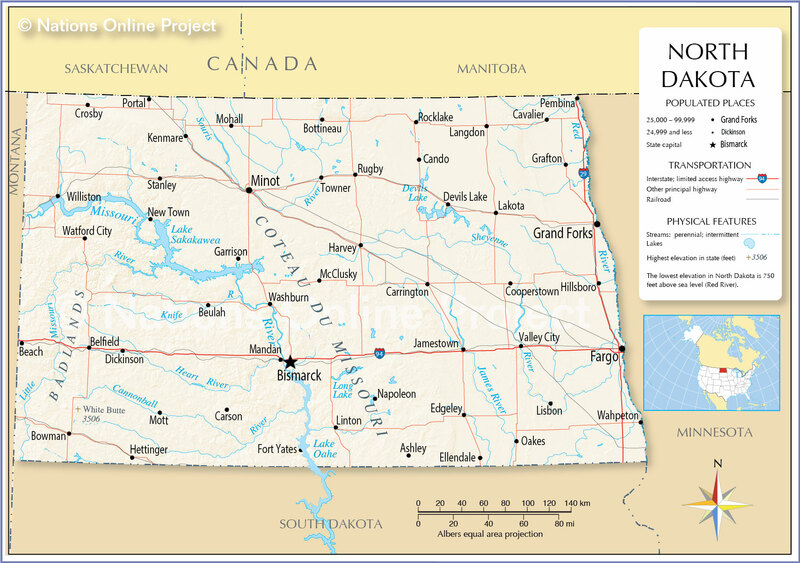 A detailed map showing the US state of North Dakota with boundaries, the location of the state capital Bismarck, major cities and populated places, streams and lakes, interstate highways, principal highways, and railroads.